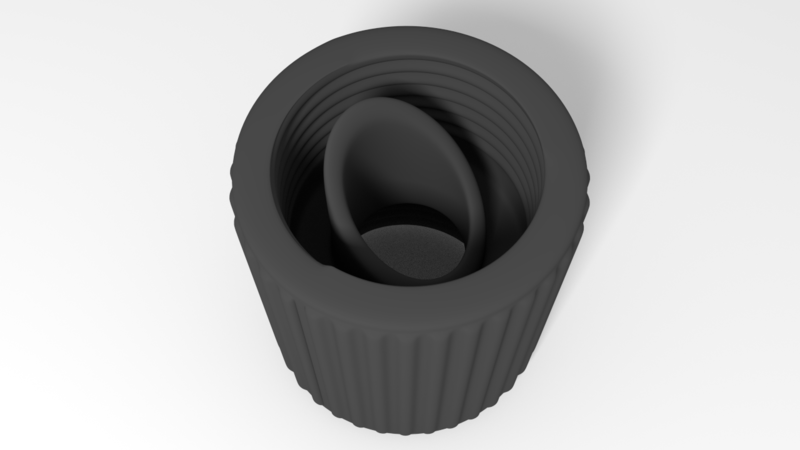 One of the aim of the spring team at EPFL was to design a new cap for secure sample collection. We need to keep the GMO reporter bacteria from being released into the environment. Originally, with the Swiss Environmental Agency, we are approved to use a vial with a hermetic cap, where the water sample will be introduced by a syringe. The idea was to replace the syringe by a double cap, hermetic to prevent the bacteria from leaving the vial. Also, syringes are extra waste that can be dangerous if accidentally left in the field. It can prick and be the cause of transmitting diseases. 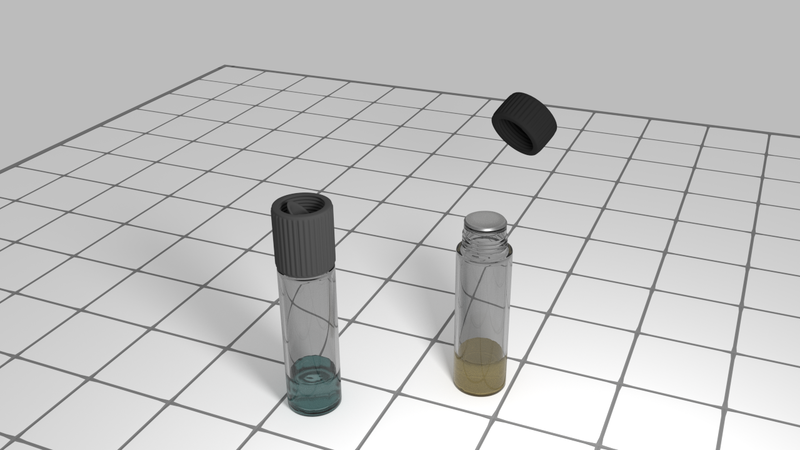 Here are the first models of prototypes of this double cap, also your comments and ideas to improve it are welcome. 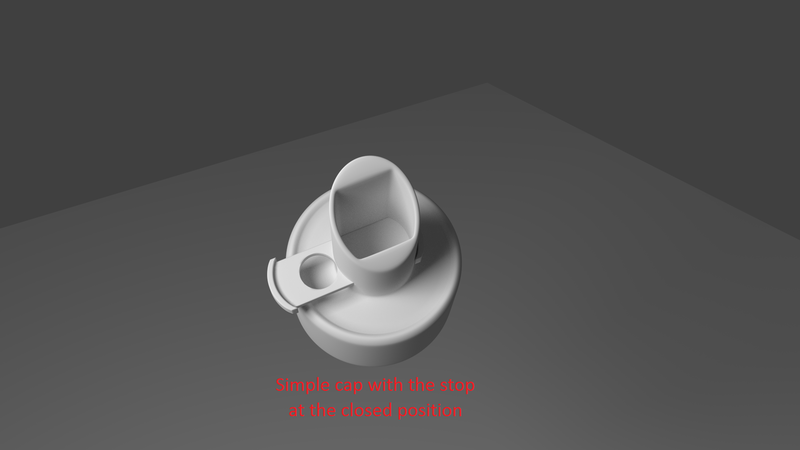 We have modeled our idea with Blender, an opensource 3D modelling software. The double cap is made in one piece, which includes a pointed connector and screw threads on both ends to screw on the sample collection vial on one side and the bioreporter vial on the other side. The bioreporter vial must have been previously hermetically closed by an aluminum seal. We imagine something like a sealed top of a yoghurt, or a packaged juice product. This seal will be pierced by the connector when we screw the double cap with the bioreporter vial. After linking the two vials, the design is such that we do not need to separate them and are able to measure the mixed bioreporter-sample with the current fluorimeter prototype. First, collecting a sample of water to test in a glass vial. This sample must be filtered, also we can for example, put a coffee filter in front of the opening of the vial when we collect the water. Moreover, because we will mix the two samples in a closed system, we can add a limited and measured volume of collected water, shown by a line on the vial. Secondly, the side of the double cap with no connector is screwed on the sample collection vial. Then, we remove the black cap on the bioreporter vial, the aluminum seal preventing the bacteria way out. 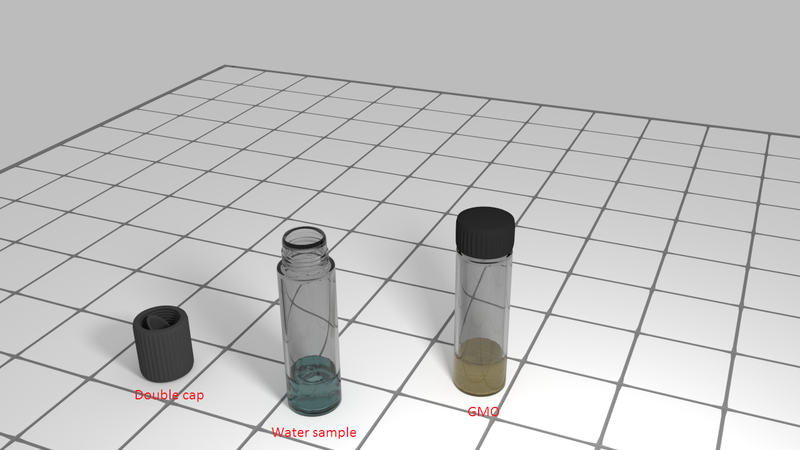 The bioreporter sample have been beforehand prepared in laboratory and also embed by the cap. We screw this vial to the other side of the double cap, which with the help of the connector, will open the seal. 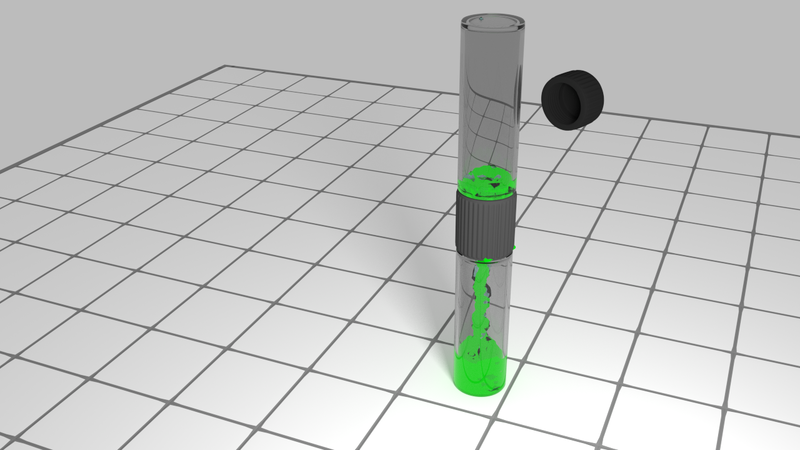 The bioreporter sample will flow on the sample collection vial across the connector. To be sure that the sample and the bioreporter mix well, and all of the bioreporter solution sees the water sample, we turn over the system to collect all of the liquid on one side..
We can make the measurement in the vial where there is the mix of bioreporter and the field sample, the other empty vial staying linked by the double cap. The double cap has some predecessors. The idea of a 2-part liquid system came from previous discussions. 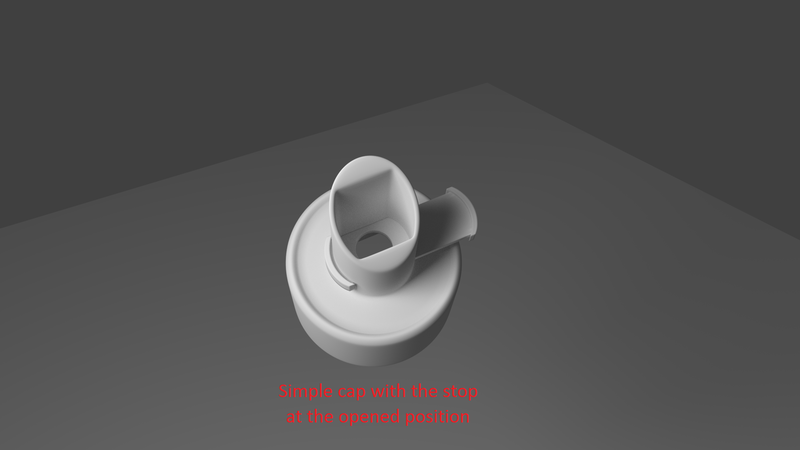 The first idea was a simple cap with a connector. The connector had a stop, which allowed for an open or closed position to let the sample of water flow or not. 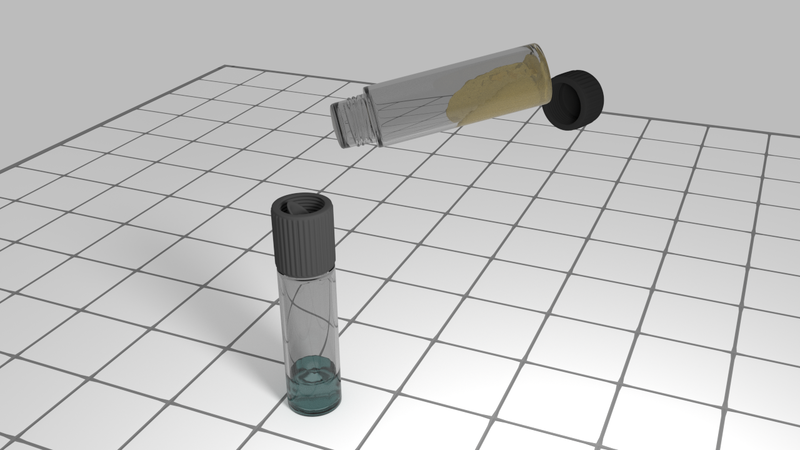 We kept the idea of containing the bioreporter from the environment by sealing the vial with an aluminum, to be pierced by the connector. 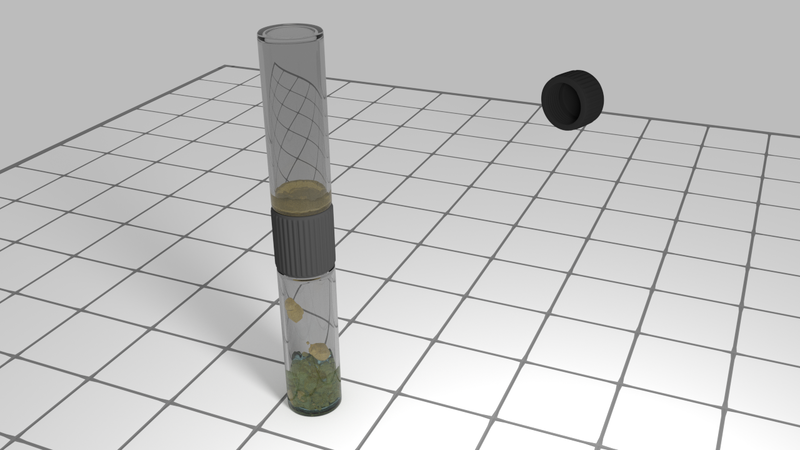 After collecting the sample of water with a glass vial, the idea was to screw the simple cap on this vial, with the stop in closed position. Then we pierce the seal of the bioreporter vial with the connector, guided by a little ledge around the simple cap. Then we would move the stop on the open position to let the water sample flow into contact with the bioreporter. We would finally remove the simple cap, close the vial of sample+bioreporter with its original black cap to make the measurement with the fluorimeter. After discussion, we noted that a removable cap will have surfaces potentially having touched the bioreporter exposed to the environment. To eliminate this possibility, we decided on physically prototyping the current design. It would be great to have all the pieces autoclave-able, so that we can reuse the double cap and the vials over again.